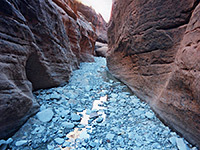 The third drainage south of Maidenwater Canyon is Swett Creek, a medium sized canyon 10 miles long with several short stretches of narrows in the upper half then a deeper, boulder strewn gorge lower down. Swett meets Trachyte Creek at the high water mark of Lake Powell though the water level has decreased a lot recently and the shoreline is now over a mile further downstream. 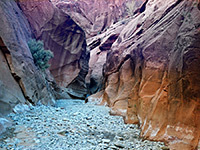 This is an easy canyon to explore as there are no real obstructions, just one short stretch with potholes that may need wading, and it offers a variety of hiking opportunities; as well as the narrows, Swett Creek has a few side canyons of interest, the area around the lake is very peaceful and scenic, and continuation hikes are possible up Trachyte. Swett Creek drains the southeastern slopes of 10,723 foot Mount Holmes in the Henry Mountains and flows into Lake Powell at the north end of Trachyte Bay. Its upper end splits into several small branches which cross UT 276 roughly half way between UT 95 and Bullfrog Marina. The main fork runs under the highway half way between mile posts 13 and 14, maybe about 13.6. There is a little area for parking on the east side of the road, just north of the canyon. 17 views of Swett Creek. TopoQuest topographic map of Swett Creek. Parking for this hike is on the east side of the road, just above the main fork of the creek, which by this point has already formed quite a deep gorge that winds into the distance heading towards a large group of slickrock domes. 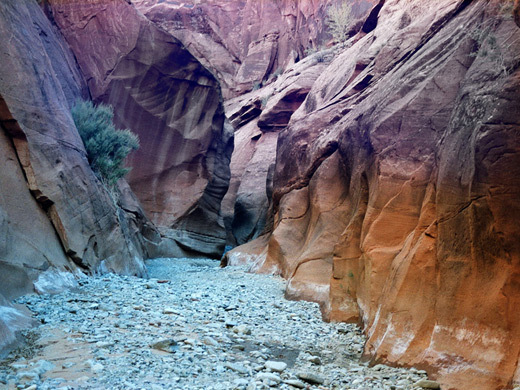 It is easy to scramble down to the dry, stony streambed then walk along the flat canyon floor and round a few bends to where the creek becomes slot-like, quite dark, sheer sided and overhanging in places but always rather shallow and never narrower than about 3 meters. Rocks in this early section are Navajo sandstone, forming smooth walls streaked with the familiar desert varnish and rising above to form the sides of high, rounded domes and ridges. 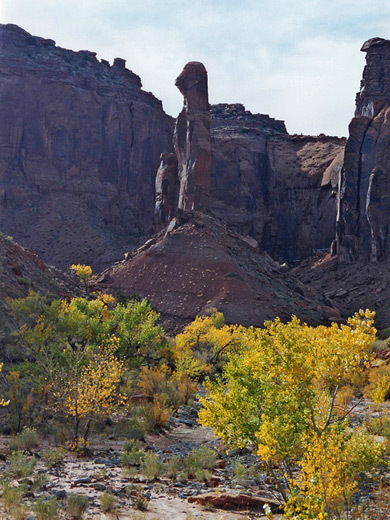 Another branch joins from the right and the canyon deepens a little as the bendy, medium width narrows continue for another mile or so, opening out when the Navajo is replaced by thin-bedded strata of the Kayenta sandstone layer. This part has a permanent stream for a while, flowing through some pretty pools, over fluted terraces and past other eroded formations, and lasts for another 30 minutes until the creek starts to cut into the deep red rocks of the cliff forming Wingate sandstone. There is no immediate change in narrowness but the canyon walls are now more generally vertical, the canyon deepens and remains quite winding, later becoming more like a slot canyon although the only true slot section is just before the end, where the channel drops into a 200 yard section with typical water-carved curving walls, several chokestones and pools, which may require some wading after wet weather. Around the next bend, the Wingate ends and so do the narrows. The canyon is now 500 feet deep and remains so, widening gradually, for the next 3.5 miles to the high water mark of Lake Powell, passing cottonwood trees, large boulders and bushes - quite flat apart from occasional steps downwards over ledges of the Chinle Formation, though loose pebbles and patches of clayish mud make walking sometimes a little difficult. Near the lake is the distinctive Hoskinnini Monument, a tall, slender pinnacle rising to a head shaped top, like an Egyptian sculpture. Past this the stream begins to flow once more, and at one point drops over a 3 meter high shelf forming a small, pretty waterfall, then enters an entrenched channel with grassy sandbanks and clumps of reeds at either side which soon meets the larger streambed of Trachyte Creek, along which the waters flow rather more forcefully. 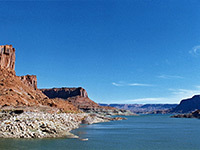 The combined channel is many meters wide and curves away to the point where when full, the waters of Lake Powell begin (a hike of 7 miles from the road), though in fall 2002 the lake was still over half mile distant - the stream continues to widen steadily and soon the waters are snaking across sandy flats, meeting the lake at an deltaic expanse of mud, driftwood and quicksand, an impressive scene framed by whitened rocks at the edge and crumbling cliffs of deep maroon sandstone higher up.